« I have a sudden urge to organize my cables. In this article I compare the costs of network bandwidth transferred out of Amazon EC2, Google Cloud Platform, Microsoft Azure and Amazon Lightsail. 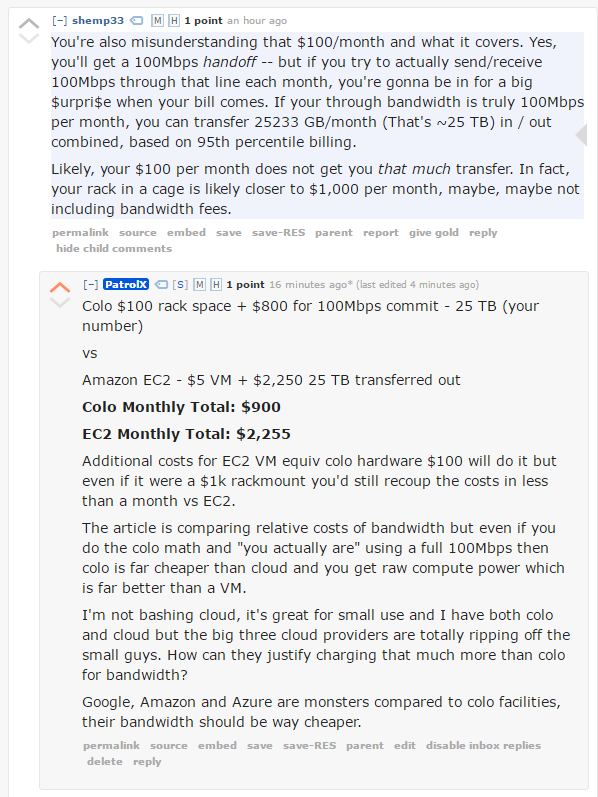 Bandwidth costs are one of the most ridiculously expensive components of cloud computing, and there are some serious inconsistencies in the industry, especially with Amazon. If you move a significant amount of data you should think twice before moving to the cloud, these bandwidth prices are truly ridiculous and there’s no way they can be justified when compared to colocation facilities. This entry was posted on 2018/10/26 at 12:00	and is filed under Amazon.com/.de/.fr/.uk/..., Cloud, Containers, Infrastructure, Power User. You can follow any responses to this entry through the RSS 2.0 feed. You can leave a response, or trackback from your own site.